Brilliant! Even my husband enjoyed it! Anyway, back to the point. She comes across as a nice, bubbly sort of person with a good line in self-deprecating humour, which is something I always enjoy. A quick look at her website confirms this. It was the business about children in the interview that grabbed me though. Or rather, her lack of them. She’s a year or two older than me, and she has none and I have three. My reaction was rather mixed. For one thing, I couldn’t really understand why it was of interest to the interviewer. I can’t ever remember reading an interview with a man that commented on his decision to have children, or not to have children. Why is it considered important when a woman doesn’t want children? The assumption is always that a woman must want a child. It wasn’t me that wanted children; it was my husband. In fact, for many years, I actively didn’t want them. I was persuaded, and most of the time I am very, very glad. But if I’m totally honest, especially after the few weeks I’ve had lately, reading the lines “I had other priorities with what I wanted to do with my time” and “I get to spend my time doing things I enjoy” did make me slightly envious. If I didn’t have children, I would have a lot more money and a lot more time. I’d have a lot less ties and a lot less pressure. I’d be able to go off to the other side or end of the country to do research whenever I needed to. But I do have children, and as such I am tied to Manchester. The most telling line in the entire piece, as far as I was concerned, was “I have been educated out of the natural reproductive function”. One of the reasons I’m doing my PhD is to prove to myself that I am able. My mum always said that the drawback of educating women is that they then get stuck with the children. I have the equivalent of two degrees and a teaching certificate. I had earned my own money. Then I had children and instead of having intelligent conversations with people with similar interests and intelligence, I was stuck at home talking to babies and toddlers and the four walls. It can be mind-bendingly boring, even when you believe that you are the best person to bring up your children and you have no wish to send them to a nursery or childminder. There is also the change in other people’s perception of you: to most people, a stay at home mum must be incapable of framing an inteligent sentence. I was lucky in having a few friends that were available during the day to talk to (over the internet, at any rate) who never stopped treating me as an intelligent human being. And it’s partly because of them that I am now doing my PhD and thoroughly enjoying myself. But there’s the real irony: I suspect that the real reason I’m doing the PhD is precisely because I have children. I needed to prove to myself that I could be as good as all those other doctors of philosophy. And the motivation wouldn’t have been there without the children that make it so much more difficult! This week has been hard. I’m tired. Very tired. If it were just the work, it would be fine, but the added pressure of parenthood is difficult at times, and this was one of them. I’ve been reading (yes, again). Mainly theoretical stuff on monarchical republic and oral culture. A friend pointed out that I really ought to know my monarchical republic debate inside out. I didn’t. I still don’t. But I do know it a bit better than I did a week ago! I’m struggling to see what’s so revolutionary about the concept of the Elizabethan monarchical republic. Maybe it’s because as a concept it’s been around as long as I’ve been researching. Or maybe I just can’t really see why it’s any different to the concilliar rule of the minor. On Tuesday I did a 10 hour day. I started with a course on how to write for oral presentations, which was interesting. It did rather state the obvious, but sometimes that’s just what you need to get you focussed. All I need now is somewhere to put it into practice. Then I went into the ‘office’ and read for a few hours (yes, you guessed it – monarchical republic) and finally at 5pm I had my last Spanish class. Next week I have a written exam and the following week I have my oral, which rather scares me. But I did find out the results of the listening exam I sat before Christmas, and I got 71. I was extremely pleased, mainly because I thought I’d completely messed it up but also because I came about 5th out of a class of 20+. It has given me a bit more confidence. Just a bit. On Monday I met with my supervisor and we looked at what I need to do for my next panel meeting. It should be in July, but had been pushed back to September because of my unusual start. We decided to try to bring it forward to August, because my supervisor thinks that I will be ready by then and I would like to try to get back on track – I’m self funded and there will come a point when the money runs out! As far as I’m concerned, my three year deadline for completion is exactly that. So I’m going to start with a chapter on ballad responses to Mary. Although I am not intending to organise my source material by genre in the long run, we think that it’s probably a reasonable way to start. So I have to be prepared to completely re-write my work, but the idea is that there isn’t a word or idea in the chapter that won’t be used in the final draft. I have 2000 words to write to start with, either on some of the ballads or on the historiography of the oral tradition, so I think I will go for the historiography first to get it out of the way and give myself a grounding on which to base the rest of the work I do. This morning, as a break from the theory, I spent hours and hours looking at the catalogue of the Lancashire Record Office and searching A2A. I have identified a couple of things that might be useful, which is jolly nice! Today I’ve been looking at Cardinal Reginald Pole’s letters. It’s an interesting, European perspective on Mary’s accession. To be honest I’ve not got a great deal done this week. I haven’t been feeling very well, and I suspect that I’ve been overdoing things over Easter trying to keep the children occupied as well as doing quite a lot of reading. Somehow, I’m going to have to make better arrangements for their summer holidays. Yesterday, I put a post on my Twitter feed asking for peoples’ thoughts on self-funding PhDs. I was really staggered by the response I got: 60 tweets on the subject, with a really diverse range of feedback and opinions, some of which hadn’t previously occurred to me. What does occur to me is that this is a pretty hot topic, particularly at the moment with the current University funding situation. I’d like to list a few buzz words, first of all, which I have found to be regular occurring concepts when people think about self-funding. I’ve started telling my children that I’m working. It’s easier. “Mummy is doing a PhD” is completely incomprehensible to an 8 year old, let alone a 6 year old or a 4 year old, so I’ve always told them I was writing a book. But recently I’ve realised that to them, that doesn’t matter, it’s not important. Daddy goes out to work; mummy stays at home writing a book so obviously that’s less important because she’s here most of the time. So I’ve started to tell them that I work, at home mostly. When my little boy lost his voice recently and didn’t go to school the day I needed to get some books from the university library, I took him to ‘my office’. He sat in our shared postgraduate workroom in complete silence (well, almost – he squeaked occasionally) for more than 4 hours, and he didn’t want to come home. This morning when I told him that daddy was going back to school today (he’s a teacher) and that they were too, he asked me if I was going back to work too, so I think it’s paying off. I’ve now finished reading ‘Tudor Royal Iconography’ by John N. King which was interesting and pointed me in the direction of a few different sources. Happily, neither of the two iconography books that I’ve read has used all the source material that I have. I’m about to start reading Alice Hunt’s PhD thesis, and then I have some books on oral culture to look at. This week I’ve also managed to work out how to persuade EndNote to separate my primary source material from the secondary. This may not sound like much, but it’s hugely important and I was ridiculously pleased. My children go back to school on Monday, and juggling my work with having them at home has proved rather a challenge. Much as I like having them around, and I do, it is much easier to work when they are out during the day. My plan now is to work out exactly what source material I’ve got that no-one else has used, and what angle to take to make my thesis really original. Today I kept coming across references to Cranach. I’ve been looking at some of the paintings and I can’t help thinking that none of the women have ever had a baby. Or if they did, then the sixteenth century had some impressive personal trainers. Not a single stretch mark in sight. Not a sign of sagginess. 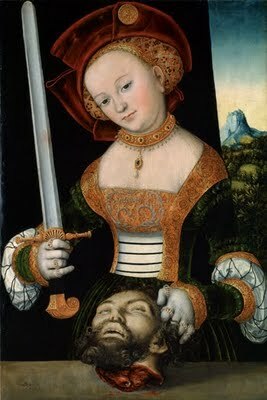 There are lots of extremely thin-waisted, Barbi-esque paintings of Judith carrying the head of Holofernes. Mary I was compared to Judith in several contemporary sources including a sermon by James Brooks.